Little things make a difference, right? 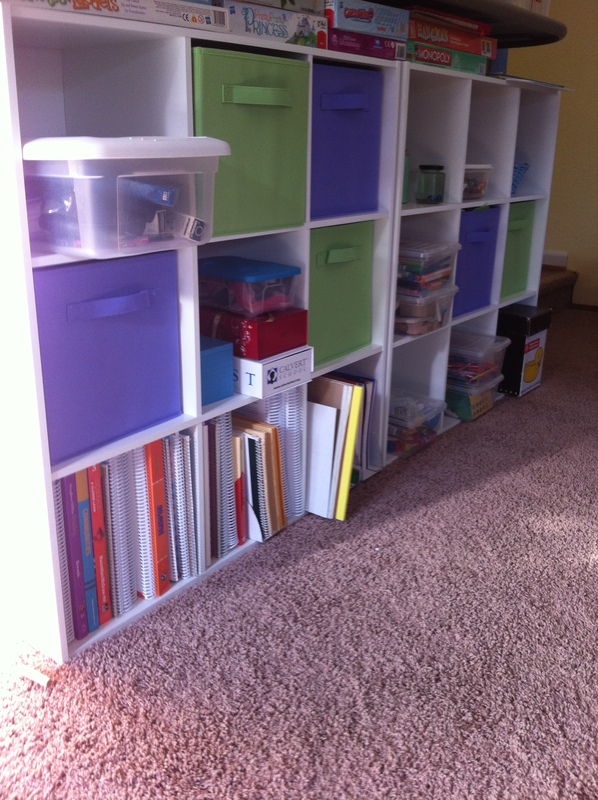 We purchased a cubby system for our school room to house all the kids’ games, art supplies, and school books. Beyond Cocoa taking every opportunity that first week to empty all the board game boxes onto the floor, this has been WONDERFUL. Everything has a proper place, and it’s easy for the kids to get their stuff out AND put it away. The shelf fits nicely under a counter that was meant to be bar-height but was always a bit too tall to sit at, a bit too narrow to put anything on, and a bit too damp from dishes waiting to be washed or loaded into the dishwasher. So far, school is wonderful this year. Mimi has kindergarten with her cousin and grandma twice a week in the afternoons, Ernie and I do her school work while the toddler sleeps after lunch, and everyone is calm and happy. I’ve been careful with our schedule this year to only plan things that we need or REALLY want. I laid out a list of goals for each child, and then struck out whatever didn’t meet those goals. The local co-op classes were cut, as was the afternoon drop-off gym class at our YMCA, but we’re keeping a bi-monthly group music class, bi-monthly church activities for Ernie, and weekly trips to the gym where the young kids get a pre-schoolish setting upstairs, and Ernie and I go zumba. We’ve left time for field trips and errands in the morning, kept Cocoa’s nap time secure, and everyone wins.